If you want to inhibit angiogenesis, foods to avoid will range from processed products with a high fat content to sugar. Anti-angiogenesis therapy shows great promise in treatment and prevention of cancer, especially in its early stages, prove multiple studies. However, as drugs that can regulate this process are prohibitively expensive, the most affordable way is to modulate angiogenesis through diet. This is difficult as to achieve the best results you’ll need to not only avoid certain foods but also include others that will help your body control this process most effectively. A diet high in sucrose increases fibroblast growth factor (FGF), which isn’t a bad thing on its own. In fact, a study published in the Journal of Nutritional Biochemistry indicates that a controlled variation of this diet can help obesity treatment by providing the body with more energy to burn. However, FGF stimulation is far more sinister in the long run, because it’s one of the most potent angiogenesis stimulating factors. This means that its overstimulation might lead to an uncontrolled vessel growth, which in itself is a major contributor to cancer development. Sugar, especially refined, is a danger to your health on many levels. Therefore, adding it to your list of foods to avoid benefits angiogenesis fighting plan as well as improves your general wellbeing on many levels. Note that all sugar variations contribute to FGF stimulation. You should control your intake of fructose, sucrose, and glucose to stay as safe as possible. Not only are these products high in sugar and carbs, which make them angiogenesis-inducing foods to avoid by default. They are also high in fats, and a high-fat diet is directly tied to cancer risk growth via angiogenesis (Molecular Carcinogenesis). Cutting fats from your diet is essential due to a variety of reasons, not the least of which is that they contribute to obesity risk. Bear in mind that obese and overweight people are at a higher risk of angiogenesis-facilitated cancer as well. After all, the fat layer also needs blood vessels. Therefore, as it grows, so do them, and this process can get out of control very fast. An unhealthy diet that often serves as one of the main causes of obesity exacerbates the problem, which results in your cancer risk skyrocketing. High in fats, sugars, and who knows what toxic chemicals, junk foods do not only promote unhealthy levels of angiogenesis. Any foods to avoid list must include these products as they are extremely bad for your health overall. They do not provide any nutritional value except a ton of empty calories. However, those calories come from substances that contribute to severe damage to your cardiovascular and digestive system. Through them they affect hormone levels as well as factors that naturally modulate angiogenesis. Simply put, junk foods ‘fuel’ cancer in a variety of ways and severely increase the risk of tumor growth. The situation only gets worse if you wash them down with soda, which is full of sugar. Canned products, as a whole, contain a variety of ingredients that are bad for you in large quantities. 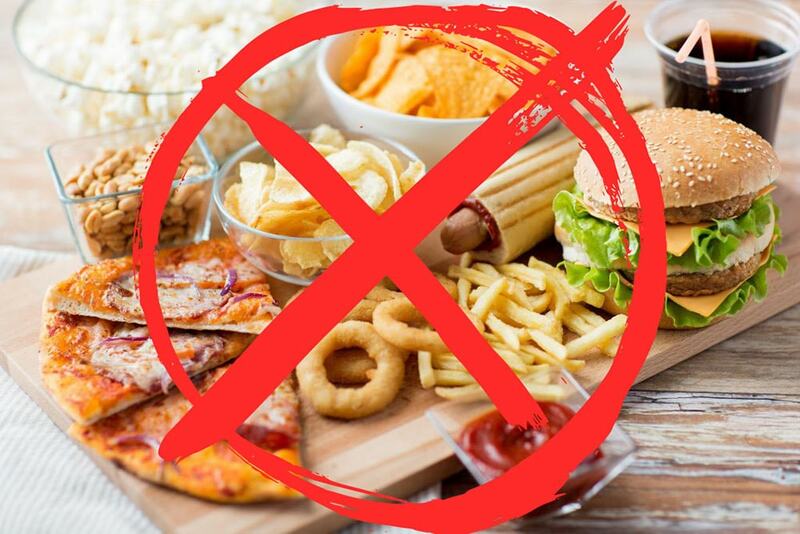 They are particularly high in sugar, sodium, and fats, which means they deserve a place at the top of the unhealthy angiogenesis-inducing foods to avoid list. Don’t forget that eating these products often also increases your risk of weight gain. If you are looking for a quick meal, better use frozen veggies to whip up a quick soup and make your own sauces and salad dressings. Those can be stored for over a month in the fridge. Processed (cured, salted, smoked, etc.) meats are one of the main contributors of colorectal cancer growth. They are recognized as carcinogenic foods and it’s recommended that you avoid them altogether. The varieties that contain nitrates and nitrites are the worst for your health, but also the most common on the market. If you want to reduce cancer risk, switching to a vegan or vegetarian diet will be best. In case this isn’t for you, be sure to eat only fresh meat products that you cook yourself. Grilled and baked meats are best as you need to reduce the amount of fat during cooking. Note that red meat as a whole is believed to be a carcinogen. Therefore, to keep your diet as healthy as possible, you should stick to poultry. Make that beef steak a treat for special occasions and only buy meat from grass-fed animals. No matter what it says on the label, frozen meals should be on your foods to avoid list. Angiogenesis isn’t the worst thing they contribute to. They are also very low on nutrients, but high in fats, sugars, and calories. This makes them a major risk factor for obesity. If these products make up a larger part of your diet, you might also develop nutritional deficiencies. These often speed up cancer growth as well as lower your body-s resistance to developing tumors in the first place. Alcohol is generally close to the top of any list of foods to avoid. Angiogenesis isn’t a major issue with it but alcohol is a major carcinogen regardless. Note that nearly all types of it contribute to tumor growth and mutation because of the compounds alcohol breaks down to when processed by your body. However, there is some controversial information about red wine. This beverage is believed to have anti-angiogenesis properties. That’s because red wine contains large amounts of resveratrol, which is a potent angiogenesis inhibitor. This means that an occasional glass of red wine can be included in your cancer-prevention diet. However, be careful not to go overboard. A lot of alcohol is never good. Angiogenesis Stimulating Foods to Avoid: Why Should You Care? Angiogenesis is a natural process that plays an essential part in maintaining life. It’s the process that forms new blood vessels in your body, and it’s more active in women because of the menstrual cycle. In healthy individuals, angiogenesis is controlled through a balance of stimulating and inhibiting factors. However, poor diet (high in fats and sugars mostly) tips this balance. Uncontrolled angiogenesis isn’t a direct cause of tumor appearance, but it’s what feeds it as tumors need blood to grow. That’s why knowing what the angiogenesis-stimulating foods to avoid are can help you fight cancer. However, any therapy aimed to ‘starve’ tumors should be not only about avoiding problematic products but also by consuming those that naturally inhibit angiogenesis. A healthy diet with a lot of dietary fiber from fresh fruits and veggies, as well as green tea, legumes, soy beans, and walnuts will be your best ‘weapons’ in this fight. Do you have any experience with anti-angiogenesis diet? Know any other foods to avoid to fight and prevent cancer? Have any questions? Please, share it all in the comments below!